Fokker D.XXI Duo Pack "3.sarja & 4.sarja over Finland" Seven Fokkers D.XXI were delivered to Finland in 1937. Three years later, Finnish government ordered license production of this aircraft powered by Mercury engine in National Aviation Factory (Valtion Lentokonetehdas). In total, forty two Fokkers powered by Mercury engine served in Finland. Due to the shortage and deliver troubles with Mercury engines, Pratt & Whitney Twin Wasp Junior engine was adopted to this aircraft in Finland. The first machine of this purely Finnish version was test flown in January 1941. Trials revealed that the aircraft is slower and less maneuverable that the original Dutch version. Eventually, only 50 machines of this version were produced. Both versions were significant for Finnish Air Force. 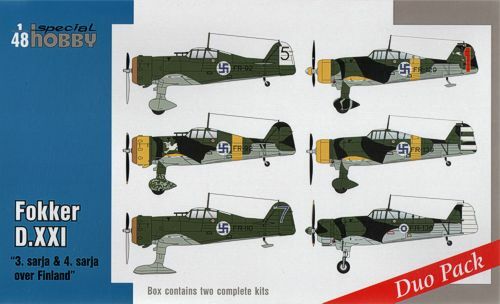 Duo Pack brings you both versions of Fokker XXI in one box. You can choose between wheel or ski undercarriage. Decals contain three interesting camouflages for each version. Resin parts for Mercury version also contain slots for this Finnish version.